Some Nigeria don tok how many hours in a day dem dey get light for dia area. Dis tok na reply to wetin Babatunde Fashola, wey be Nigeria Minister of Power, Works and Housing, say some states for di kontri now dey enjoy almost 24 hours of electricity. Wia Nigeria dey 'hide' di light dem wan sell give oda kontris? 'We dey see light four times in a year for Ileya festival, Easter Monday, Christmas eve and 31 of December.' Crownmeetjoy V Jokey Obrigado write for inside post for BBC Pidgin Facebook page. Oga Fashola tok for Channels Television programme on Wednesday say "as I sitdon here some states dey get almost 24 hours steady light- Kebbi, Yobe. Some dey get five, some get 10 and dey are still"
Anoda pesin Gbenga Gbelela for Ikorodu say dia light na 23-24 hours a day, im say no doubt power supply don improve for im area. While Sani Mohammed say for Niger State (north central Nigeria) di situation bad, for Agaie town wia I dey work and live , di summary na say no light except wen NEPA BILL dey ready. 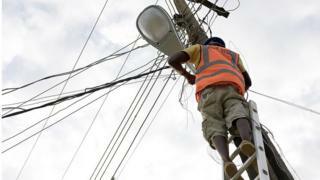 Fashola say even as transmission don grow to about 8,100 watts for December, distribution networks na di major problem wey make light no dey every time. Im say federal goment dey ready to invest N72 billion to take install transformers and expand distribution. Di minister say electricity supply don increase because dem don increase di transmission capacity.